Researchers have managed to make a molecule no-one knew how to synthesise - methylhydroxycarbene - and trapped it in an ultra-cold cryogenic argon matrix. But what happened next was unexpected: the target molecule started disappearing. 'That shouldn't be happening because you've got it trapped in argon, surrounded by inert gas molecules,' says author Wesley Allen, a computational chemist at the University of Georgia, US. 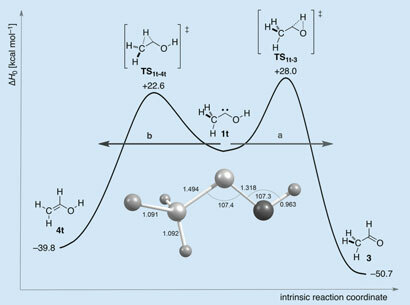 Allen's 'back of an envelope' calculations confirmed that the carbene couldn't be reacting with other molecules. Nevertheless, not only was the carbene reacting when it shouldn't, but it was giving the 'wrong' product, according to transition state theory - acetaldehyde instead of vinyl alcohol. The clue to what was happening came when they repeated the experiment with a deuterated analogue of their compound. The deuterated molecule didn't disappear. 'That was the first indication that it might be quantum mechanical tunnelling,' Allen says. The hydrogen atom is light enough to be treated as a quantum mechanical object: both a particle and a wave. In this instance, the hydrogen tunnels through the potential energy surface to a different product. According to Allen, the hydrogen has a tiny probability of tunnelling, around 10-18. But in the argon matrix, it's just sitting there, running up against a potential energy brick wall about 1013 times a second. If you multiply those two numbers you get a reaction half life of about an hour, which is just what the team observed. 'The probability [of tunnelling] is tiny, but on a human timescale it leads to a pretty fast reaction,' says Allen. This explains why the carbene was disappearing, but why was the 'wrong' molecule produced? Why go under the higher barrier (on the right of the figure) rather than the lower one? Allen explains that the barrier penetration depends on the width times the square root of the energy difference between the molecule and the peak of the energy curve. In this case, the width of the peaks trumps the extra height. To give the 'right' vinyl alcohol product the hydrogen has to cross a barrier that is about 20 per cent wider and, while that doesn't seem like a lot, it makes a difference of three orders of magnitude. 'It's a very nice example of the interaction between theory and experimental,' says Barry Carpenter, director of the Physical Organic Chemistry Centre at Cardiff University, UK. This means that a reaction could be under thermodynamic control, kinetic control or 'tunnelling control'. Tunnelling control 'adds a new dimension,' Allen says, but Carpenter says he suspects that the more chemists look for tunnelling, the more will be found. 'And I think that might eventually change what we teach undergraduates,' Carpenter adds.